My mother used to make the most delicious zucchini bread. Whenever friends were coming over to our house or she needed a culinary gift, it was one of the most popular recipes in her repertoire. It's amazing to me that a bread starring a vegetable (technically, zucchini is a fruit, but try convincing your kids of that fact) was so appealing to a kid like myself, but it was. So, if you have a little one who is normally zucchini averse, this bread may turn them around on it for good. I don't know why so many people have emailed me recently asking for a healthy zucchini bread recipe, but I'm happy to oblige with a weelicious version. There are a lot of zucchini bread recipes out there loaded with white or brown sugar, so I decided to make mine using agave nectar instead. I also opted to bake them in muffin cups instead of a loaf shape so it's more kid friendly. Zucchini is a good supplier of potassium and vitamin A and it has a consistency that makes for a deliciously moist bread. When I made a batch for breakfast last week, Kenya turned into a muffin eating machine. It was then that I realized that it wasn't important if zucchini was a fruit or a vegetable. To him, it was simply delicious. 2. Place the first 6 ingredients in a large bowl and whisk to combine. 3. Place the remaining ingredients in a separate bowl and whisk to combine. 4. Pour the wet ingredients into the flour mixture and stir just until the ingredients are combined. 5. 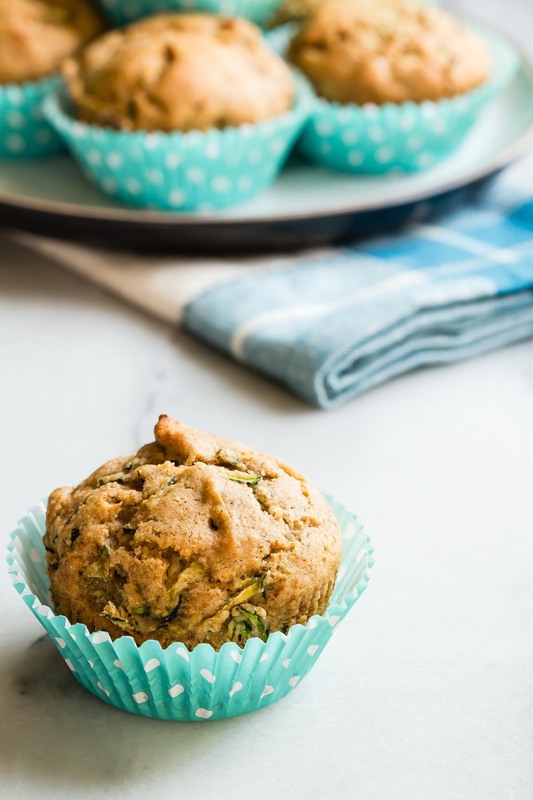 Pour the zucchini mixture into large or small muffins cups (I like to use a small ice cream scooper to make spooning into the muffin cups easier). 6. Bake 15 minutes for small muffins and 20 minutes for large ones. Great recipe. My 20 mo old LOVED these. where can I buy agave nectar? You can buy agave from any health foods store such as Trader Jo's or Whole Foods, you can also substitute it with honey or maple syrup too! Yes it is, did you put the agave in it? You can substitute it for honey or maple syrup as well. I don't have wheat flour, can I use just all purpose flour? Can you sub. the eggs for applesauce? We have an egg allergy. I don't see eggs in the recipe-? I can't even count how many times we've made these. My son (21 mos) loves to make these with me. They are fast, simple and so delicious! All the proportions turned out just right for us. Makes about 24 of our mini muffins (some muffin tins might be smaller or larger for those who are getting different quantities). Thanks for all the wonderful ideas, I just love your site. Keep them coming! oh - one more thing - i love zucchini bread, but really don't make it b/c it has SO much sugar to make up for that zucchini taste - I was so excited to see these which use agave nectar instead! thanks! I just made these and they are awesome! We all love them! I was out of whole wheat flour so I used an organic 9 whole grain pancake mix instead, I also used applesauce in place of the oil and about 2 1/2 cups of zucchini. Threw in a few walnuts and they are a major hit! Thanks!!! Catherine, I tried making them with the flaxseed as an egg replacer and...they turned out awesome!! :) Wholesome, delicious, and filling. Great recipe! Awesome!!!! I'm so happy they came out great! These worked out well, according to my 2 year old girl and her daddy who gobbled them up. Easy, fast recipe and fun to do together. I cut the zuchini into bits which worked well. If I decide to use sugar (gasp, I know! :) ) - what is a useful formula to use to replace the agave? Not looking to make the recipes sweet - just looking to use ingredients I have on hand....Thanks. Do you have honey? You can use that :) or even maple syrup. Just wondering if this is a freezable after baking one? have you tried to? I try to bake ahead, and made these today- she loved them! but have way too many for a one year old! Can these be made into pancakes? My 20 month old is rejecting them, but I think it's the presentation. hmm sounds interesting! I haven't tried making them into pancakes but I'm sure it wouldn't hurt to give them a try! Let me know how they turn out if you do. I would make the pancakes too thick though just in case they don't cook through. Catherine what would be a gluten free substitute for the whole wheat flour if I used an All-Purpose GF flour? Another winning recipe. I'm learning to just go ahead and double your recipes when I'm trying them out so I can have leftovers! I could not agree with you more, making just 1 batch of weelicious muffins at a time, is a crime in this home. Made 48 mini muffins! Hope they freeze well. How should we go about defrosting them after baking and freezing them? These are not very sweet, which is great for my lil' one, but not a big hit with the hubs. Hope the my 1yrold likes them! How do save this recipe in my recipe box, I'm using my iPhone so I don't see any tab to save it. Made these for my 2 kids - one of which i would describe as a anything green-o-phobe. I told them they were \"incredible hulk muffins\" and he actually did eat them. Thanks for the recipe! how much applesauce for 1/3 cup veg oil? and, can i use only wheat flour, don't have all purpose flour. Do you peel the zucchini or do you grate it with the skin on? Thanks. Made these the other day and they are amazing!! My 16 month old usually doesn't care for muffins, but LOVED these...she sat in my lap holding a muffin in each hand and then got upset if I reached for the last one on the plate! Will have to double the recipe next time because they're already gone. Yum!!! I mixed this recipe with the strawberry one becasue I had some strawberries I wanted to use. So I just bravely added about 1/2 a cup of diced strawberries and some lemon zest...YUM! Cant wait for my twins to wake up to taste them! 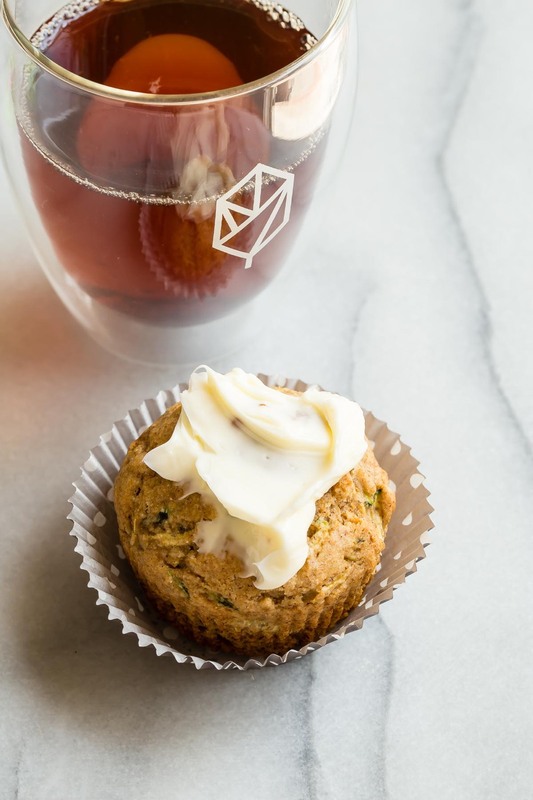 What if we wanted to make a savory version of these muffins? I don't have agave and she's not supposed to have honey yet. Could we substitute cheese for the agave and not use vanilla? Any ideas for a variation like this? Thanks! Made these this weekend, so yummy! My husband rolled his eyes at first, and then he had a bite and now he loves them! Took a little convincing to get the kids to try them (they're now called Green Apple Muffins), but they do like them. After they've been eating them for a few days I'll tell them about the zucchini! 2) if I use the flaxseed/water substitute for egg, does that ratio replace one egg or both? Can you use pureed veggies in these instead of shredded? I have some pureed zucchini and carrots that I need to use up. This recipe is great! We added raisins and walnuts and used honey instead of agave nectar since it's what we had on hand. We also subbed some of the sweetener for molasses to give it a nutrient boost and added 2 tablespoons of salba (chia) seeds for even more nutrients. We also subbed 1/4 cup of the wheat flour for millet flour to add some protein. I was nervous that they would taste to \"healthy\" but even my husband loved them! It's true that they are not very sweet but my husband liked them and my toddler (who is SUPER picky) ate two mini muffins this morning! Thanks! I've made these countless times. My 18 month old and her friends always love these muffins. Today I decided to mix it up - subbed out half the zucchini for carrots. Because I knew they'd lend a sweeter taste, I reduced agave to 1/2 cup. The zucchini/carrot muffin has been a big hit at our house, and I'm happy to get two different veggies in. Just made these today with some zucchini fresh from our garden and they are awesome! My 2 year old has already had one and is now hanging off of the stove trying to get at the rest! I think next time I might add some raisins or walnuts. I've never made zucchini muffins before but I had to find something to do with the 3 random zucchini's in my fridge! This recipe was delicious and super easy! My little sous chef was a great help and sprinkled some mini chocolate chips on the tops of the 2nd batch (yea, I pretty much ate the 1st!). Thanks for such great recipes for the wee ones!! I've made these twice, yummy! The second time I put carrots in also and it turned out great. Me, my mom, my eleven year old sister, and my two year old sister loved them! Thnx catherine! I just made these and they are delicious! I used whole wheat pastry flour in place of the whole wheat flour and the all purpose flour. I also added a 1/2 cup of raisins and cut the oil down to 2 Tbsp (I added 1/4 cup whole milk yogurt to replace the oil and keep the muffins moist). Can I use shredded apples in place of the zucchini? I need to make apple cinnamon muffins for my son's school holiday party but can't find a healthy version of an apple cinnamon muffin recipe. My family loves these so I thought maybe I could just sub the apples for zucchini and have another winner. All I can say is YUMMY!!!!! My 22 month old, 4 year old, and 7 year old only stopped eating them because I made them. I made two batches and froze one. I am planning to make another batch tonight (so much zucchini) this time with raisins. I don't think I could go back to other recipe. Thanks!!! First time on blog but I'll be back for sure! I just made this for my 13 mon. old and he loved them!! (And so did I!) I added an extra 1/2 cup to make it 2 cups even of zucchini, I have to hide all the veggies I can get in, and added 2 T ground flaxseed and 2T wheat germ, they turned out great! Can I use Mexican squash (the light green zucchini-looking things found at the farmer's market) instead of zucchini in muffins and breads? If I wanted to make these with gluten free flour, like with oat flour, how would substitute for the all-purpose and wheat flour? So I made these tonight... I used flax \"eggs\", added chia seeds and only used 1/4 c. agave... SO DELISH!!! These were moist and delicious. I had to mix agave, honey and maple syrup because I was short on sweeteners but somehow it worked! Serve with some cream cheese. So good! Can I use only whole wheat flour? Can I use honey instead of agave? You can use all whole wheat flour, but the muffins will come out more dense and with a nutty flavor. You can always use honey and agave interchangeably at a 1:1 ratio! My daughter (25 months) actually ate one and liked it - and when I tell you she eats nothing I'm hardly exaggerating! I did offer it to her bottom side up so she wouldn't see the zucchini coming out of the top :) it worked, though. I followed the recipe just reduced everything by halves since I only made six. They were moist and delicious. Thank you! Can you sub honey for the Agave? Aaah, thanks for the ice cream scoop tip. How much easier it was! Good Recipe!! I also used the applesauce instead of oil. I brought them over to a recent playdate and everyone liked it! I made these for my very picky 22 month old last night. As I was washing dishes I saw them being stolen off the counter. She loved them and she never eats veggies let alone whole grains. Thanks! Love these muffins and so do my girls. We are gluten free as two of my girls have autism, so we substitute gluten free flour blend for the flours used in this recipe and add additional baking time. I also substitute honey for agave as I find it lends a better flavor. These are delicious! I sub whole wheat pastry flour for both cups, and use coconut oil. My one-year-old devours them! I just made these, they are awesome! My toddler ate it too, great way to give veggies. I made these last week and we all loved them. My daughter asked me to always bake these muffins! I didn't have agave nectar, so I used honey instead. I also added a little nutmeg because I am crazy for it, but I am sure they would have been lovely without it too. Thank you for another great recipe! Delicious! My 17 month old loved them so much, he ate two right away! He's a picky eater, so these are perfect! Thank you for providing such great recipes! So yummy!! I used honey instead of agave since that is what I had I added a grated Granny Smith Apple and had cooked them for extra 10 mins and they are fab my new fav!! 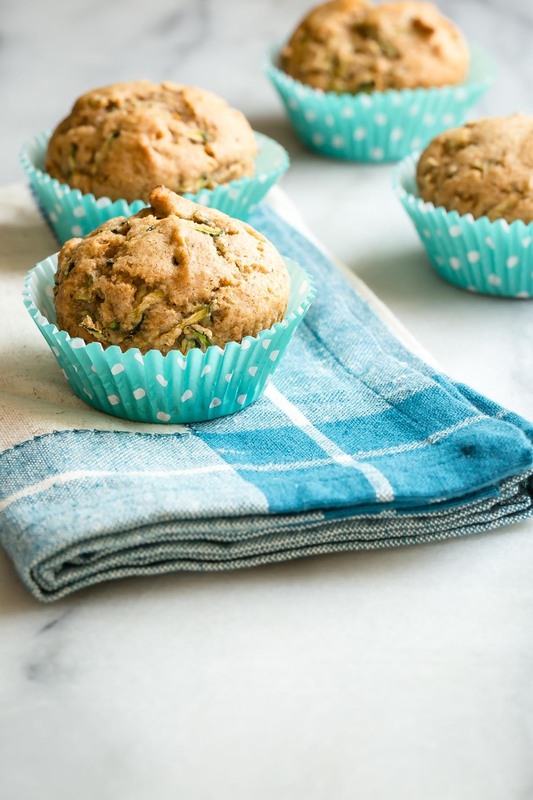 Looking forward to making these muffins - quick question though - should I squeeze the water out of the zucchini before adding to the remainder of the ingredients? I am used to doing that with all other zucchini recipes but yours does not specify. Thanks in advance! I don't squeeze out the liquid. It adds moisture to the muffins! I love this recipe and have made it many times, the muffins are delicious! Today I made it again and added one ripe banana and it was a delicious twist!